Fourth Row Center: Film Writings by Jason Bailey: On DVD: "An Englishman in New York"
On DVD: "An Englishman in New York"
An Englishman in New York is a slight, minor work, but it is absolutely worth seeing as a showcase for a brilliant John Hurt performance. 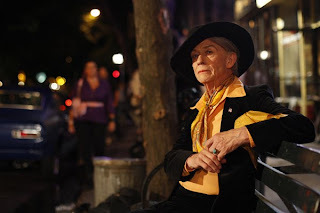 Quentin Crisp, the famed writer, raconteur, and all-around gay icon, is a role Hurt has played before (the 1975 TV version of Crisp’s The Naked Civil Servant was a breakthrough role for the British thesp), but he brings to it the full skill of his decades as an actor; it’s a snappy, razor-sharp performance, full of bitchy charm and devilish grins. It’s also a warm, likable turn that pauses for pathos without clobbering the audience. If only the movie were having as much fun as he is. They’re sometimes in sync, particularly in the opening scenes, which find Crisp arriving in New York in the early 1980s, thoroughly delighted by what he sees—he struts through the village to the sounds of Donna Summer and Rhinoceros, his voice-over assuring us that “without her outcasts, the metropolis would be a very dull place indeed.” Brian Fillis’ screenplay has moments of punchy exhilaration, but it often verges on didacticism; Cynthia Nixon is compulsively watchable as performance artist Penny Arcade, but her first set of scenes are written like position papers. And Fillis doesn’t trust his own subtext. An early scene finds Crisp, at a cocktail party, failing miserably to connect with a young gay man who has been told to admire him. The awkwardness of their encounter is palpable, but that’s not good enough—he has to walk away with a friend and sneer “Welcome to the 1980s” under his breath. Before that, however, he has a bit of a crisis of conscience; during a question and answer session, he makes an ill-advised throwaway joke about the then-exploding AIDS epidemic, and then stubbornly refuses to apologize for it. The controversy alienates him from much of the gay community; for a time, his only close friend is the young painter Patrick Angus, played by the passable (if rather forgettable) Jonathan Tucker. Hurt isn’t quite evenly matched with the young actor, but their scenes have a sweetness and honesty to them (“There is no great dark man,” Crisp advises his disciple. “Trust me, I looked”). Director Richard Laxton has some difficulty staging big scenes. The theatrical sequences are too clean and easy; the Q&As feel scripted and tightly controlled instead of spontaneous (which they presumably were), and when that one goes wrong, the direction is too on-the-nose. The entire audience turns immediately, shaking their heads and muttering and overacting like extras in a high school play. It’s a major moment in the plot (as it should be), but it’s handled with the clumsiness of an amateur. In smaller, quieter scenes he fares much better; he appears to like actors, and is smart enough to stay out of Hurt’s way. Paul Englishby’s music is also troublesome; the score is too damned pushy, sitting on nearly every scene and trying to crush it. Laxton may have relied on it too much to try and build momentum; Fillis’ script keeps starting and stopping, jumping ahead years at a time in such a fragmented fashion that it almost feels as though scenes are missing (the picture runs a suspiciously brief 74 minutes). However, Laxton finds exactly the right nimble tone in the closing scenes, and has the good sense to hold that tone for as long as possible. Its final moments are just perfect, and they, along with Sting’s closing title song (it’s from his 1987 album …Nothing Like The Sun and is based on Crisp, who was casual friends with the singer), leaves the viewer with a warmth and good cheer that the film may not have entirely earned. In spite of its flaws, my affection towards An Englishman in New York is genuine. It feels incomplete, yes, but what’s there is frequently effective, and Hurt is just a joy to watch. "An Englishman in New York" hits DVD on Tuesday, February 23rd. In Theaters: "Soundtrack for a Revolution"
New on Blu: "Smokin' Aces"
On DVD: "No Impact Man"
On DVD: "The Invention of Lying"